A recent market study published by the company, namely 'Desktop Calculators Market: Global Industry Analysis 2013-2017 and Opportunity Assessment 2018-2028', consists of an inclusive assessment of the most important market dynamics on desktop calculators. The company has done some direct research on the principle structure of the desktop calculators market. The report commences with the executive summary of the desktop calculators market report, which includes a summary of the key findings and key statistics of the market. It includes the market value share for leading segments in the desktop calculators market. Also it includes supply side trends, demand side trends and recommendation for the desktop calculators market. Readers can find a detailed market structure and definition of desktop calculators market and product types, in this chapter, which helps in understanding the basic information such as market dynamics, key players, and regulation policies included in the report about the desktop calculators market. The definition section considers the factors included and excluded for the purpose of this report. Key pointers and factor which impact the market and product innovation/ development trends are also included in this desktop calculators market report. Readers can find the outlook of the global desktop calculators market, considering various factors associated with the growth, which would help in tracking the market’s current scenario, with key inferences drawn from historical data, current trends, and future prospects. Macro-economic factors influencing the market are also discussed in this segment. 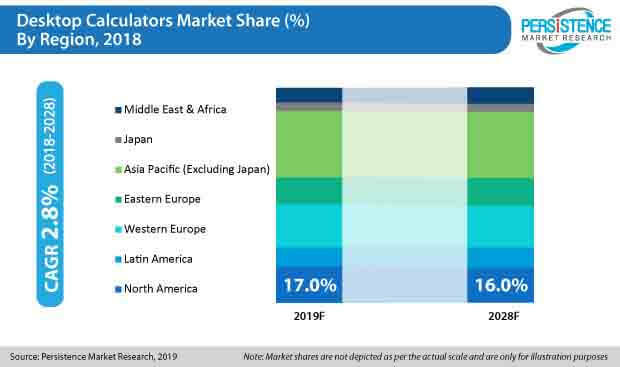 Based on region, the desktop calculators market has been segmented into North America, Latin America, Europe, East Asia, South Asia, Oceania and Middle East & Africa. Readers can find detailed information regarding market key trends, developments and market attractive analysis in the desktop calculators market based on region type. This chapter summarizes the information regarding, market key trends, attractiveness analysis for the desktop calculators market based on system. The desktop calculators market has been segmented on the basis basic functional calculators, scientific calculators, financial calculators, graphical calculators and other type of calculators. This chapter summarizes the information regarding, market key trends, attractive analysis for the desktop calculators market based on the end-user. The desktop calculators market has been segmented on the basis of household, retail, consumer and others. This chapter includes detailed analysis of the growth being observed in the North American desktop calculators market, along with country-wise assessment for the United States and Canada. Readers can also find information on regional trends, regulations and market growth based on system, application and countries in North America. This chapter includes detailed analysis of the growth of the Latin America desktop calculators market, along with a country-wise assessment, including Brazil, Mexico and Rest of Latin America. Market attractiveness based on various segments is provided for the Latin American region. Important growth prospects of the desktop calculators market can be found with market attractiveness based on type and end-use. European countries such as the U.K., Germany, France, Italy, Spain, Benelux, Russia and rest of Western Europe are included in this chapter for industry analysis. China, Japan and South Korea are the leading countries/regions in the East Asia that are assessed to obtain the growth prospects of the East Asia desktop calculators market in this chapter. Readers can find thorough information about the growth parameters. Market attractiveness based system, and application for desktop calculators market in the East Asia region is also provided in this section. India, Thailand & Indonesia, Malaysia and rest of South Asia are the leading countries/regions in the South Asia that are assessed to obtain the growth prospects of the South Asia desktop calculators market in this chapter. Readers can find thorough information about the growth parameters. Market attractiveness based system, and application for Desktop calculators market in the South Asia region is also provided in this section. Australia and New Zealand are the leading countries/regions in the Oceania that are assessed to obtain the growth prospects of the Oceania desktop calculators market in this chapter. Readers can find thorough information about the growth parameters. Market attractiveness based, system and application, for desktop calculators market in the Oceania region is also provided in this section. This chapter provides information on how the desktop calculators market will grow in major countries of the MEA region, such as South Africa, GCC Countries, and Rest of MEA, during the period 2018-2028. This chapter provides information on how the desktop calculators market will grow in emerging countries including India, China and Mexico during the period 2018-2028. The competition section includes market analysis by tier of companies, market concentration and market share analysis of the key player of the desktop calculators market. This chapter includes a comprehensive list of all the leading manufacturers in the desktop calculators market, along with detailed information about each company, including company overview, revenue share, strategic overview, and recent company developments. Market players featured in the report include Canon USA Incorporated, Texas Instruments, Casio Computers, Hewlett Packard, Lyreco, Sunway Electronics Company, Sharp Electronics Corporation, Citizen Systems, Flair Writing Industries Limited and Hamilton Writing Industries Limited. The last section consists of a glossary of the assumptions and acronyms used in the desktop calculator’s market report, followed by the research methodology. This chapter helps readers understand the research methodology that is followed to obtain various conclusions, important qualitative information, and quantitative information about the desktop calculators market. Global desktop calculators market size in 2018 - nearly US$ 1,366.0 Mn. The desktop calculator market is expected to grow at a CAGR of approximately 2.8% during the forecasted period of 2018 to 2028. The basic functional calculator sub-segment is expected to hold a compelling market value share in the type segment for the desktop calculator market in 2018. The growing use of desktop calculators at schools, universities and other educational institution to reduce the complexity of solving problems, is significantly promoting the desktop calculator market. Various educational bodies across the United States and Europe have imposed regulations pertaining to the compulsory use of desktop calculators after the eight-grade, owing to which the desktop calculators market is estimated to witness significant growth during the forecasted period. The basic functional calculator sub-segment is expected to hold the highest market value share in the type segment for the desktop calculators market. Due to the increasing number of financial institutions such as depository institutes such as banks, building societies, credit unions. Contractual institutions such as insurance companies and investment institutions such as investment banks and brokerage firms. East Asia and Europe are estimated to remain the largest regional markets for desktop calculators. Technology is playing an important role in the electronics market which in turn is affecting the desktop calculators market in a positive way. The desktop calculators market in Middle East & Africa is estimated to register the highest CAGR during the forecast period. The economy of Middle East & Africa is increasing rapidly where every country is trying to develop an increasing number of desktop calculator products pertaining to the emerging number of educational institutions, which is expected to fuel the growth of the desktop calculators market in Middle East. The desktop calculator market in East Asia is expected to witness a significant incremental opportunity. The presence of a large number of young small-scale regional players in the region is responsible for substantial growth for the desktop calculators market in East Asia. The adoption of the latest technologies and advanced systems pertaining to desktop calculators is already providing significant growth opportunities to the desktop calculators market in the region. The digitization of technology have forced many improvements in basic desktop calculator such as the improved version of graphical calculators and desktop calculators. Digitization have offered enormous opportunities for growth across several industries, sectors, regions and company sizes. With several technological innovations and M&A activities, various vendors are offering specific application products for varied end-users. With the improvement in scientific education, scientific desktop calculators are predominantly being demanded. Moreover, several budding schools in the United States and other European countries have made it compulsory to use desktop calculator for basic arithmetic after the eight-grade. Calculators in the elementary grades serve as an aiding tool to help advance the students understanding without replacing the need for other calculation methods. The use of desktop calculators can develop higher-order thinking and reasoning needed for problem solving within the information and technology based society. Desktop Calculators are also being used as an assistance for students and teachers for understanding and building fluency with arithmetic operations, algorithms and numerical relationships. Desktop calculators today are playing a key role in nurturing the student’s fluency with numbers and operations. In February 2017, Canon USA dispatched new series of business and tax calculators in order to revamp their product offerings and improve overall customer experience. A company named Bowmar LLC developed the "Bowmar Brain" which was synonymous with the early pocket electronic calculator. Originally an LED (light emitting diode) display manufacturer the company found out that they could not sell their displays to Japanese electronic calculator makers. However, in 2012, the company that sold these vintage style calculators have come into business again and have put forward their vintage calculators for the unsuspecting public.